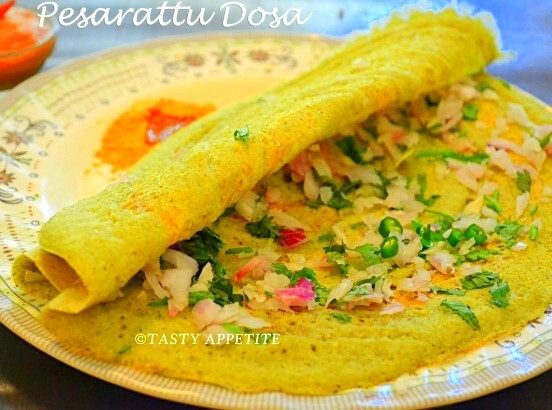 Here comes the healthy, delicious & very popular delicacy of Andhra cuisine, Pesarattu. It is very easy to prepare at home and makes a protein filled, nutritious and filling breakfast recipe. It tastes heavenly when served with kara chutney, coconut chutney, sambar, etc. In this recipe, the soaked moong dal and raw rice and ground to smooth paste along with flavorful ginger and other spices to make batter. No fermentation is needed for making pesarattu dosa. Lets see the simple video recipe to make moongdal dosa at home. Wash & soak moong dal and raw rice separately in water for 4 to 5 hours. Drain and take them aside. Add green chilli, cumin, grated ginger to blender. Add soaked moongdal, rice and salt. Add a ladle full of batter to hot dosa pan. Drizzle oil to sides and cook. Sprinkle finely chopped onion, green chilli and coriander leaves. Once the dosa is cooked and golden brown on edges, remove from flame. Lipsmacking healthy delicious pesarattu dosa is ready. It makes a perfect combo with kara chutney, coconut chutney, etc.